Britain's biggest name in mixing, Mark 'Spike' Stent has achieved international success in almost every genre. 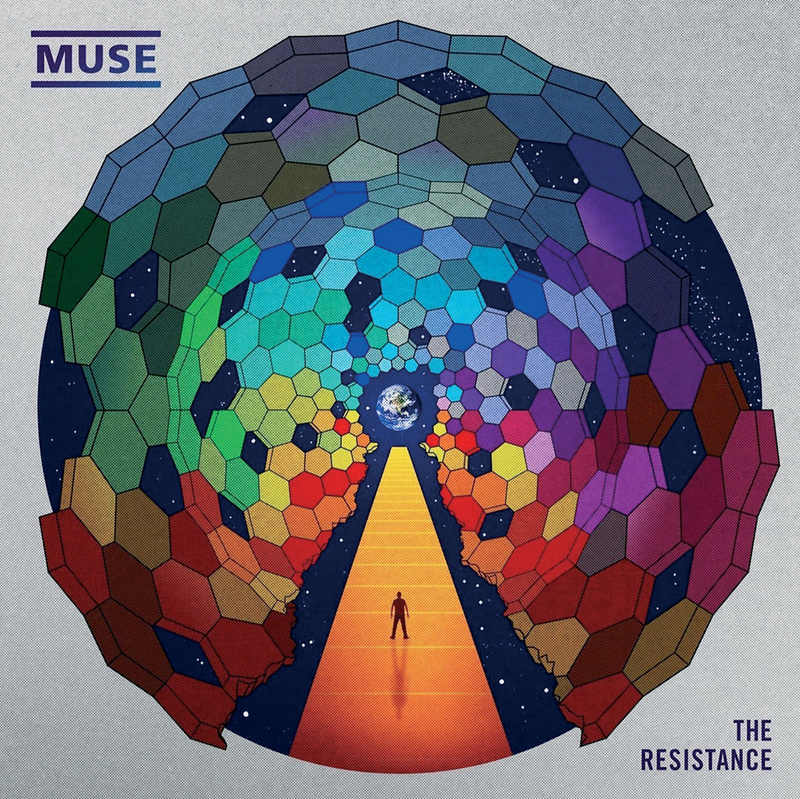 With Muse's latest album, The Resistance, he was dealing with rock at its most epic. 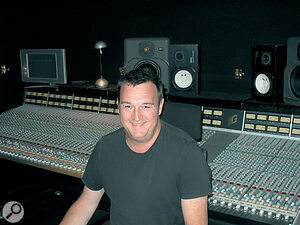 Mark 'Spike' Stent is the most successful British mixer of the last two decades, and one of very few non‑American engineers to have become a big name in the hip‑hop/R&B genre. In so doing, Stent has clocked up more than 700 credits and worked with the likes of Madonna, Beyoncé, Björk, Lily Allen, Depeche Mode, Massive Attack, Yeah Yeah Yeahs, Oasis, U2, Usher, Lady Gaga, and so on — and on. Stent grew up in Hampshire, close to the then‑famous Jacobs Studios, where he made the regular tea‑boy‑to‑engineer transition. Following a stint at Trident, he went freelance in 1987, and soon afterwards made his name with his pioneering mixes of the KLF. Stent's nickname was given to him the same year by Wayne Hussey of the Mission, who for some reason couldn't remember the name of the then 22‑year old spikey‑haired engineer who was recording the band's album Children. Since then, Stent has worked in an unusually varied array of musical genres, but in all cases he brings a signature approach to his work: ultra‑clear, ultra‑tight and hard‑hitting. Stent rarely gives interviews, but SOS has been on his trail ever since the inception of the Inside Track series, and his work on Muse's recent album The Resistance and its lead single 'Uprising' gave us the perfect opportunity to get the low‑down on his mixing methods. When I speak to him, he is in the UK mixing Goldfrapp's forthcoming album, but explains that he is mainly based in the US these days. "My family and I have lived in LA for two and a half years now. We went there in the summer of 2007 for a six‑week project, and decided to stay. My work in the US had exploded, and with 60 percent of it being there, I wanted to have a life and be around my family, so we all moved there. There was another ingredient in the mixing sessions for The Resistance that improved Stent's 'joie de mixage' even more, namely the way that Briton Adrian Bushby (Foo Fighters, Maximo Park, Placebo, Feeder, Gomez) had engineered the album. Having recorded two albums with John Leckie and two with Rich Costey, the band had taken the production helm themselves, creating huge arrangements of multi‑layered tracks, with drums, vocals, synths and other instruments, including classical orchestras, all fighting for space. Stent went out to Italy with a few choice pieces of his own equipment, among them his Lavry Gold A‑D converters, his KRK 9000 monitors, and a batch of plug‑ins and iLoks, and found it extremely easy to settle into working at Muse's studio, with equipment that was familiar to him and Sessions that were organised in a way he liked, which didn't need much organising or cleaning up. "The Sessions and the board were pretty much flat, as far as I remember, and most of the plug‑ins were added by me, so I did pretty much my own thing. Normally speaking, before I mix a track or a project, I'll ask to hear the roughs or maybe the demos, so I can get a sense of what needs to be done, where there are problems, and so on. The rough will give me an idea of what the A&R, the artist and/or the producer think is good, even though the sonics may be wrong or something in the balance isn't coming across. I then put the roughs in the Session, so I always have a reference and I can A/B them with what's going on. The Pro Tools Session for 'Uprising' is huge, with 80‑plus audio tracks — including 35 drum tracks, five bass tracks, and 20‑odd vocal tracks — plus a number of effect, subgroup and volume tracks. The drum section features no fewer than four kick‑drum mics, four snare mics, three overhead tracks, six room‑microphone tracks, and nine tom overdubs, seven of which are the same part but picked up by different room mics. Many of these elements are submixed to aux tracks, which, explains Stent, is at the heart of his way of working. It should also be noted that the Session was done in Pro Tools 7.4 (at 24‑bit/96kHz), but that Muse have since upgraded to version 8, so when studio engineer Tomasso Colliva recently pulled up the Session to take the accompanying screenshots, it showed in version 8. 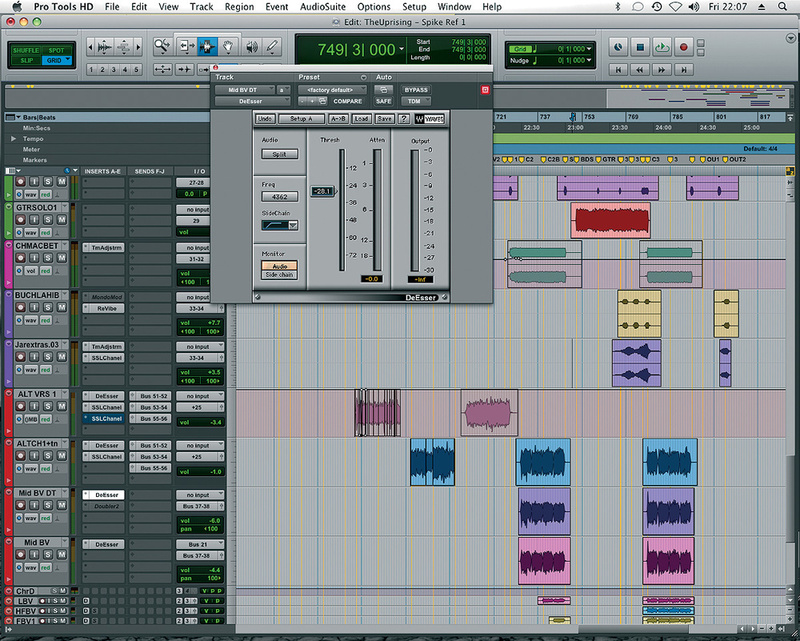 As Muse don't have the same plug‑ins on their system as Stent, not all of the plug‑ins he used are shown. Spike Stent: "It is indeed quite a big Session, drum‑wise. The way it's put together is very interesting and very clever, with, for instance, all the different kick and snare-drum mics. All the drums were brilliantly recorded, which is why I didn't need to add any samples. The session starts at 19'30” because they had done a few different versions of the song, and recorded them sequentially. This is how they managed the Session — people often work like this. In many respects, the 'Uprising' Session is completely typical of me, with four kick drums being subgrouped to one track and the same with the snare, and so on, and that's then sent to the console. I even subgroup when I'm working in the box, with sub‑compression on these groups, while at the same time having individual plug‑ins on each individual drum track. 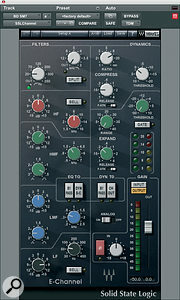 Drums: Waves SSL Channel, desk EQ & dynamics, Metric Halo Channel Strip, Chandler EMI TG12413 (plug‑in) & TG1 (hardware). The entire 'Uprising' Session is far too big to print or even view on a single screen! 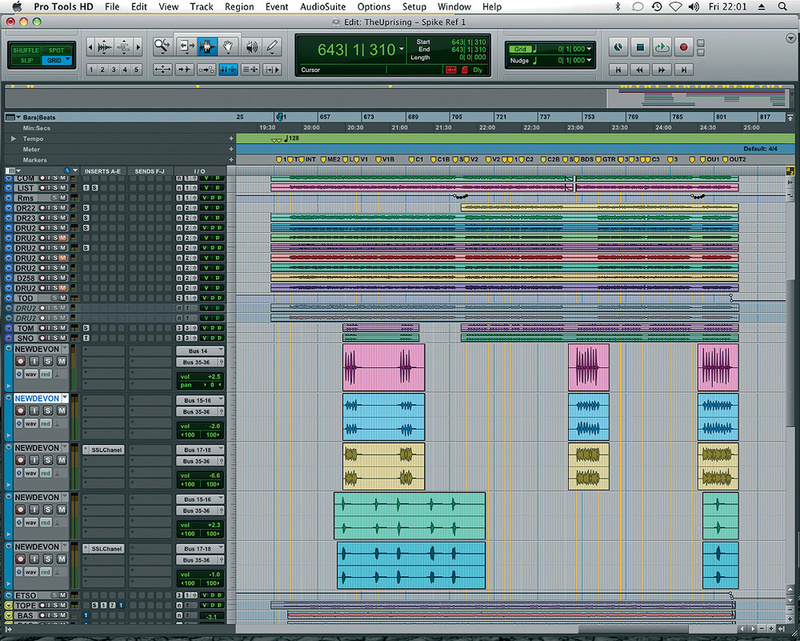 Here are some of the drum tracks, including tom overdubs (lower half of screen) added by the band in Devon. 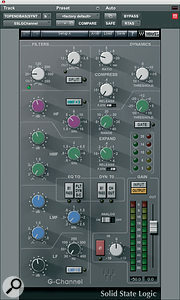 As well as mixing on his favoured SSL G‑series desk, Stent also made extensive use of Waves' SSL E and G Channel plug‑ins. These are the settings he used on the SM7 bass drum mic. 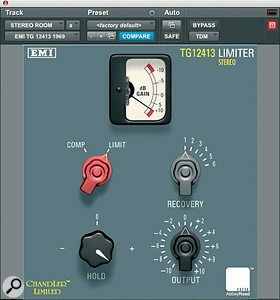 The Chandler/EMI TG12413 limiter was used to get the room mics to pump. "There's a kick master, which is a subgroup of the four kick tracks, and which came up on the desk. But I also would have had some of the individual tracks come up on the board. The same with the snare. The stereo subgroups for the toms, overheads and room mics would each have come up on two channels on the SSL, but in these cases no individual tracks were sent to the desk. "I had the Waves SSL Channel on the first kick, which was recorded with a Shure SM7. Why did I use a plug‑in and not the desk? Good question. No idea. It's what I do. I don't think about it too much. Does the SSL Channel sound like the real thing? Let's say that I like what it does and I have used them for years. I had the SSL Channel on three of the four kick-drum mics, and the 'D' on the other one [indicating the use of a plug‑in on that channel] is something dynamic. 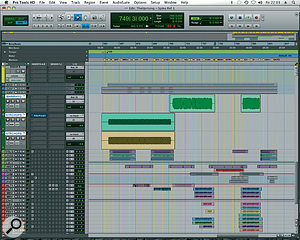 I will have used tons more EQ and compression on the SSL, all to get it to colour and punch right. I'm EQ'ing for accuracy and getting that bottom end tight. I hate flappy, untight bottom end. I like subby low, but I don't want it to sound like chaos. On this track it was tricky, because there's a lot of rumbling going on, so I had to manage the bottom end really precisely. "What I often do is have my main drum sound under the main drum faders at the left of the console, and then I'll send stuff out via the small faders to a pair of groups and then to outboard EQ and compression, and it will come back up on separate channels. With the more powerful and punchy things like kick and snare I'll probably EQ this very toppy and subby, and will then mix that in underneath the main sound. Different section of the songs may have more or less of that submixed compression and EQ. You try to find the right thing for each section of the song. I have done this process for years. I also have the SSL Channel on the snare top and snare bottom mics, and the greyed out plug‑in 'C' is probably the [Metric Halo] Channel Strip [see screen on previous page]. I will also have added lots of board EQ and compression to the snare, and nothing else, because all the space comes from the room sound mics. I did the same with the claps, the toms, and the overheads: Waves SSL plug‑in on the subgroup and EQ and compression on the board. I don't compress things to death, but I do use heavy compression. "I blended the six room mics together and automated them in the box for different sections of the song. On the console I will then have ridden them a lot for the major sections. All these different room mics are the result of the way Adrian tracks, which was brilliant, because it gave me a lot of options. I had a Chandler EMI TG12413 limiter on one of the room mics, because I'm hyping the room, making it pump a bit. Over the inserts on the channels on the console I would have had a TG1 outboard as well. Underneath the rooms subgroup track are the toms overdubs, in total nine tracks. Seven of them are the same part but with different room sounds, so it gave me a lot of colours to work with. They're subgrouped and go to tracks 13‑14 on the console. The SSL Channel helps to make the toms more accurate. The band also rehearsed and recorded in a house in Devon, and five tracks of overdubs from that are in this session; 'ETSO' is the subgroup that went to the board. Bass: Waves SSL Channel, Tech 21 Sansamp, Purple Audio MC77, Sound Toys Filter Freak. Much plug‑in processing was applied to the 'top end bass' track, from Waves' SSL G Channel, Tech 21's Sansamp distortion and Purple Audio's MC77 compressor. Guitars: Sound Toys Filter Freak & Echoboy, Empirical Labs Distressor. Given the number of tracks in the Session, it's perhaps surprising that there are only five guitar tracks: the three highlighted in the centre of the screen, plus 'HIGT' and 'GTR1' (the solo) further down. "There were five guitar tracks, split over two different places in the Session. It's the way the Session came, and because it was so well‑organised I simply worked with it as it was. The main rhythm guitar was sent to channel 22 on the board, the 'guitarchops' to 23‑24, the 'hi guitar' to 28 and the solo to 29. I had a Filter Freak on one of the 'guitarchops' and the rest was done on the board. Synths: Waves SSL Channel & Mondo Mod, Digidesign Revibe. A rare example of a reverb in a 'Spike' Stent mix! 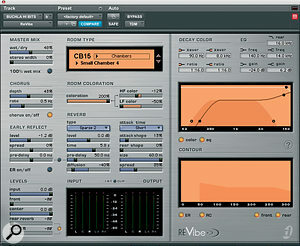 Here, Digidesign's Revibe is being used as an insert on one of the synth parts. Vocals: Waves De‑esser & SSL Channel, Dbx 902, Teletronix LA2A, Universal Audio 1176, Standard Audio Leveler, desk EQ & dynamics, Tech 21 Sansamp, Sound Toys Echo Boy. "The lead vocal tracks are called 'ALT VRS 1' for the verse and 'ALTCH1' for the chorus. 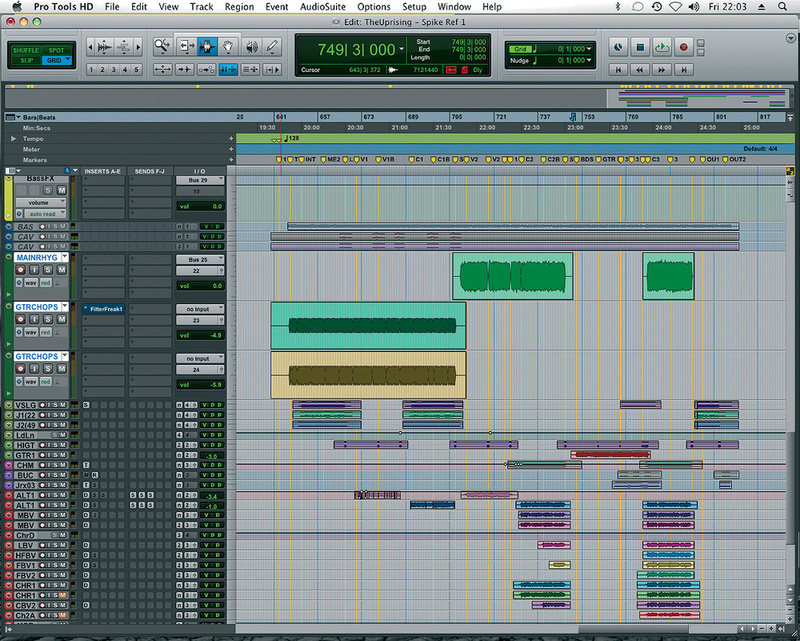 Some lead ('ALT VRS 1' and 'ALTCH1+tn') and backing vocal parts from the Session. Stent makes widespread use of de‑esser plug‑ins, but always takes care to tailor the settings to the track in question. I had Waves' De‑esser and SSL Channel on both. There would have been standard EQ and I would have automated the SSL plug‑in for different sections of the song. Do you see the '25+' marking in the I/O section? [See screenshot at bottom of page.] That means that the lead vocals went to channels 25, 26 and 27 on the board, and I had different chains on each. 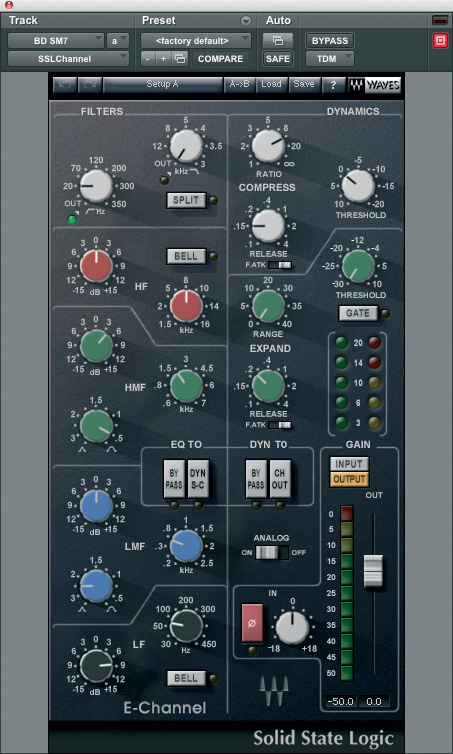 On channel 25 I would have had the Dbx 902 de‑esser, going into an LA2A, on channel 26 again the 902 but going into a blackface 1176 Special Edition, and on channel 27 the Standard Audio Leveler, which I love. It's great for colouring the sound and adding warmth and distortion. I would have mixed these in, again checking the phase. 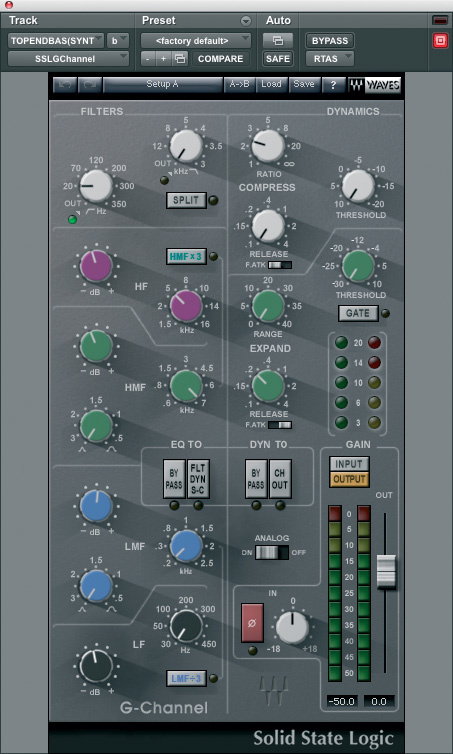 Why both the Waves and the Dbx de‑essers? I'll go in hard with scooping things out with the Waves, and the Dbx is just a general de‑esser that's just tickling the signal. My mixes are quite bright, so I really need to make sure that I keep these esses under control, depending on the vocalist and the song. The LA2A and the 1176 offer different sounds. I probably compressed the vocals quite a lot, and also would have EQ'ed them on the board. "At the bottom of the Session I had a number of effect tracks, to which I sent the lead vocals via busses 51‑56. Several aux tracks with different effect chains were created for the vocals. On this one, a Sansamp distortion feeds Sound Toys' Echoboy delay.On 51‑52 was the Sansamp, with a bit of distortion, probably only for certain sections. The Sansamp was going into an Echoboy, which was again automated for sections. Then 53‑54 and 55‑56 also had the Echoboy, with eighth‑note and quarter‑note delays. All these vocal effects are coming up on channels 39‑40 on the console, where they probably had some compression and gating.